A friend recently asked if I wanted an old cradle that had belonged to her grandmother…and no one in her family wanted. Ummm…YES! I love those kind of friends! The timing was perfect, because I have another friend due with her first baby in just a couple of weeks. Her husband is out of work at the moment, so I know this cradle will be a welcome surprise…after it’s makeover, of course. As luck should have it, I also happened upon the most gorgeous shade of blue "Oops" paint at Home Depot. 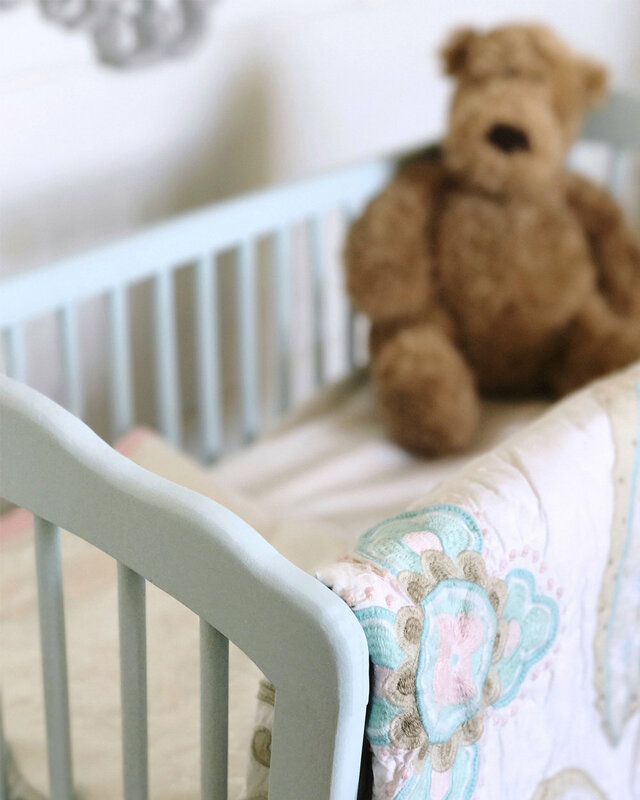 A free cradle and $2 in paint…I was beyond excited about this makeover! I usually use a brush for small projects like this, but with all those little spindles, I knew spraying would save a ton of time. The Homeright Finishmax Sprayer is my favorite. I mixed my paint with BB Frösch Chalk Paint Powder to make my own chalk paint so I could avoid priming or stripping the wood. To use chalk paint in a sprayer, you will need to add a little water. 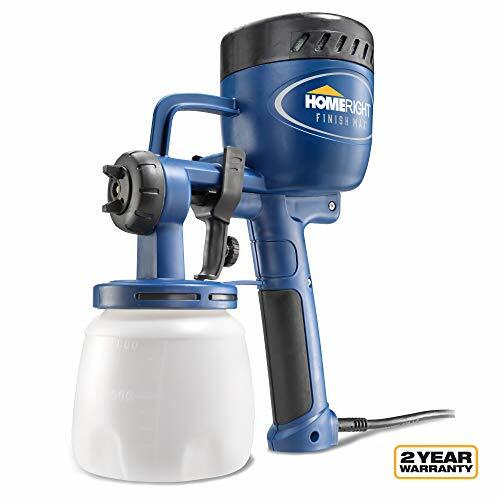 Since paints vary, it’s best to use the viscosity cup that comes with most sprayers. Your mixed paint should drain from the cup in 25-30 seconds. If it takes longer than that, add water. If it drains faster, add a little more chalk paint. 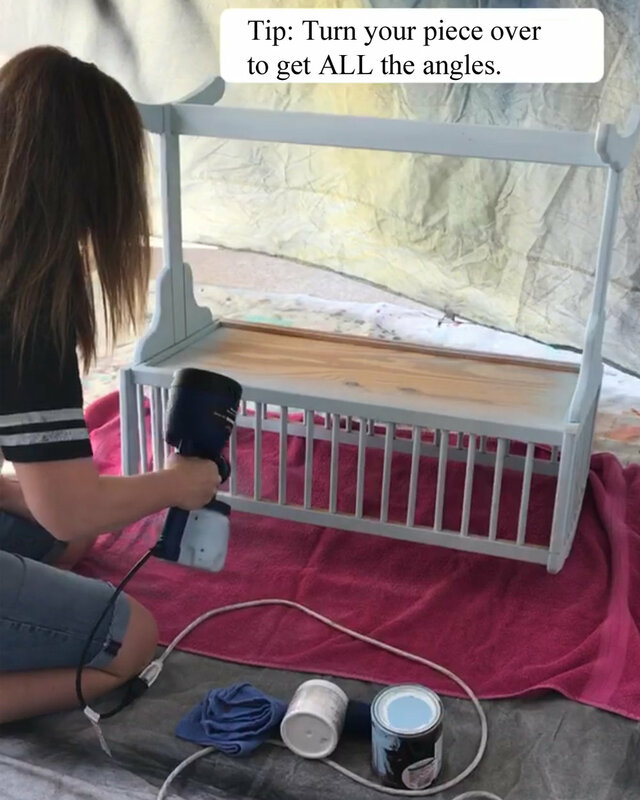 It took about 20 minutes to spray the whole cradle with 2 coats. Most areas were fine with one coat, but there were a few spots I went back over with a second pass—so maybe it’s more accurate to say 1 1/2 coats. It’s always a good idea to turn your piece upside down to make sure you get all the unseen angles. I didn’t do any distressing, just a quick pass with 400 grit sandpaper to smooth before waxing. I used BB Frösch Clear Premium Finishing Wax to seal and protect the finish. This project was complete in an afternoon and is headed to its new home next week! The cost of a quart of “oops” paint, powder and finishing wax was less than $10. Plus, I have more than 3/4 of the quart of paint left. Any gift I can put my heart into that is also quick, easy and affordable is my kind of gift!